The fight to keep access to critical vital records open to genealogical research is never-ending. The latest battle is being fought in New York City — and our help is needed. But here’s the bottom line: though NYG&B is taking the lead here, it can’t do this alone. It needs the genealogical community — those of us near New York, those of us who research in New York, those of us with ancestors who were ever in New York — to join in. Yeah, I know, it seems like we’re always fighting this issue. But the truth is, when we stand together, we win more than we lose. Thank you for spreading the word, Judy! There are negative consequences to locking records. True, there can be privacy concerns, but in many cases the records being considered to put under lock and key are necessary to positively identify an individual. This is not just for genealogical purposes but also to ‘Find’ individuals of importance that are ‘Lost’ to history. An example is something I am personally involved in. That is finding ‘Lost’ Medal of Honor Recipients. There are still hundreds of these brave men who are unaccounted for. They deserve better.They should be in graves marked with markers showing their Medal of Honor status. To prohibit researchers like myself access to their records could prevent this from happening. I’ve recently been working with a client and a 1968 Brooklyn death record could possibly answer some questions. I’ve sent my letter. If a person has a good reason to access public records, either for themselves or for someone else, such access should be granted. Reasonable fees may be charged. Please do not withhold vital statistic information from us. We need it to carry on our family history information. It’s so important for our children and grandchildren. 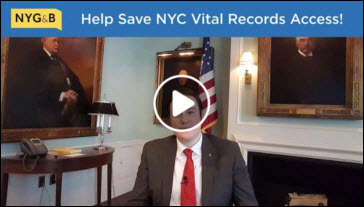 Access to these records is essential for my family’s medical and personal history as so many family members died young without sharing critical family information with their descendants. I am not favor of the proposed changes, but I also can’t agree with the proposal by NYG&B. Why do birth records need to be restricted for 75 years if the person is known to be deceased? It also seems unfair to give increased access to people who are members of genealogical societies. That would seem to benefit the group that is proposing it, while making an expensive endeavor even more so for the rest of us.